Looking for an apartment in Largo, Maryland near Upper Marlboro, Capitol Heights, the Metro, and the Boulevard at Cap Centre? Camden Largo Town Center has one, two and three bedroom apartment, loft and townhomes that are just what you are looking for! Situated minutes from FedEx Field, the Largo Town Center Metro Station, and the Capital Beltway - you can easily enjoy our neighborhood shopping, dining, and entertainment! In addition to our convenient location, our community features an array of amenities and some of the largest floorplans around with ample space in each room you’ll be sure to appreciate. Our spacious floorplans feature a full-size washer and dryer in every apartment, fireplaces, walk-in closets, vaulted ceilings, kitchen pantries, oversized garden tubs and rentable garages. Just steps from your door you can relax by the pool, enjoy outdoor dining at the gazebo grill area or break a sweat in the onsite fitness center with cardio equipment and free weights. Our onsite business center is the perfect quiet place to get work done with high-speed internet and a printer. You and your pet will enjoy the ample green space throughout the community, making it easy to stroll around the community. Residents receive a technology package included in the total monthly rent with a savings of up to 47% off retail. This money-saving package includes high-speed internet up to 100 Mbps and over 160 digital and 110 HD video channels through Xfinity X1. Stream Netflix and other apps right from the cable box or use the Xfinity Go app on your smartphone or tablet to access your digital video anywhere! When it’s time to explore, Camden Largo Town Center is perfectly located just off I-95. That makes it easy to get to events at Fed Ex Field, the excitement of National Harbor and the culture of Washington DC! Life is easier at Camden Largo Town Center. Don’t wait another minute! 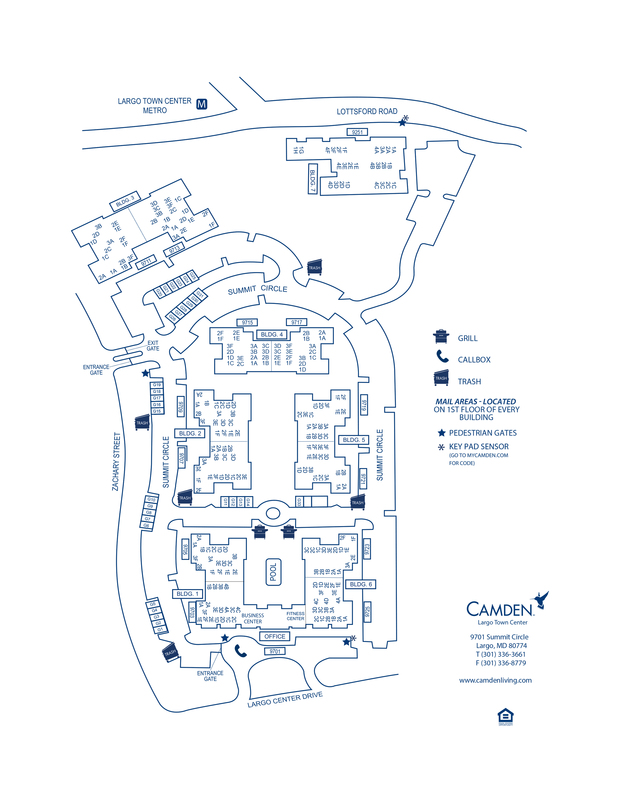 Call or stop by today to discover why you should make Camden Largo Town Center your new home! Each apartment comes with one parking permit. Additional parking permits are available for $25 per month. Parking is available on a first-come, first-served basis. We offer Reserved Parking at $50 per space per month. Detached Garages are also available for $150 per month.